Martina recounts her tragic story countless times to audiences made up mostly of the marginalized and highly vulnerable rural communities, many of whom suffer from HIV/AIDS, cancer, TB or all three. Her story is heartbreaking but filled with courage and instilled with hope. Martina was raped over twelve years ago. She was subsequently diagnosed with HIV/AIDS and within a year, she also contracted pulmonary TB. She survived, only to face the gruesome trials of cervical cancer shortly after that. As an HIV/AIDS infected person, Martina was fully aware of her vulnerability to other diseases but she was determined to face her challenges head on with a healthy lifestyle and continuous screening. Her courage pulled her through and Martina survived and was declared TB and cancer free. She soon decided to become a motivational speaker and establish support groups for those who still had to journey through the suffering and pain. In February 2015, Martina received an invitation to join Madam Tobeka Madiba Zuma on a Warrior’s Walk to honour cancer survivors. At the time, she was juggling a day job as a customer service attendant at Gautrain and also working as a motivational speaker. Shortly after, Martina was invited to join the Tobeka Madiba Zuma Foundation and share her journey to inspire hundreds if not thousands of survivors across the country. She now has a new vocation to share her story and to push people to hold on to hope, seek treatment and get assessed early. 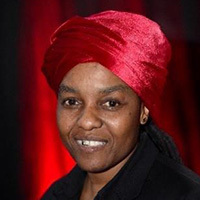 Together with Madam Zuma, she offered herself as a shield to create an honest, compassionate space that allows the Foundation to reach out beyond taboos and fear and discuss life-saving behaviours with many disenfranchised communities. “I learnt from Madam to better present myself, make my case, abide by higher ethical grounds and most of all to be the change that I want to see,” she says.